Welcome back to the maths table! We’re now learning about numbers up to 20 and there are plenty of opportunities here for exploration, play and learning. So what is a maths table? Basically I’ve just extended my 1 – 10 maths provocations for numbers up to 20 and taped it all down. Why so much tape, I hear you ask. After years of trying different combinations of boxes, baskets and zip lock bags to keep thing looking organised and enticing, I have found out the only way to stop things wandering is to stick it down. So I did. With lots of tape. Although not too much as I know I will have to peel it all off sooner or later. Great news, the number cups are back! Spotty ones this time. I did lose a few of the 1 – 10 stripy cups as my maths table at that time was perilously close to the home corner. So I’ve moved the maths table and replenished the cups. I have 2 sets of 11 – 20, one for matching to the numerals and other to the numicon print outs. 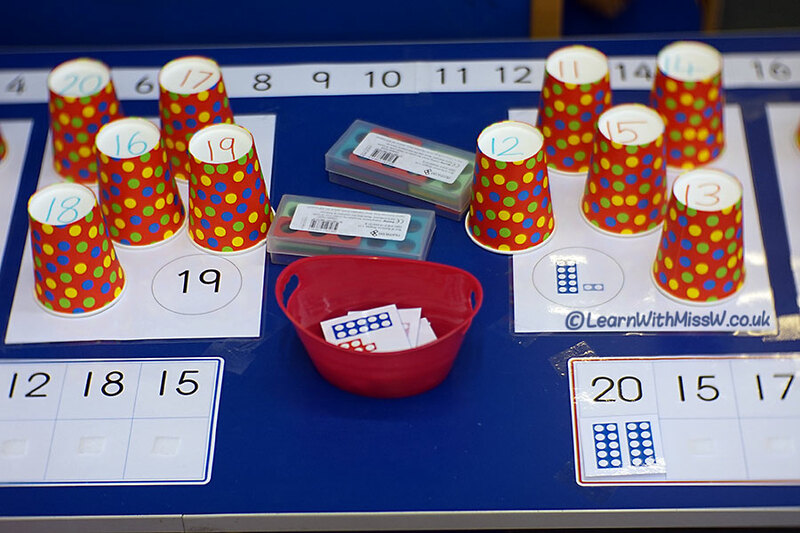 I’m reusing my numicon matching game for numbers 11 – 20 that I made last year. Each card has velcro on so the children can stick them in place. At the back of the maths table I have a 1 – 20 numberline just for a bit of support and there are a couple of boxes of numicon. As well as doing the matching activities I have described, my students have also been experimenting and playing with the resources, which is great. They’ve been making the 2 digit numbers with the numicon and matching the cups to each other in different ways.